Of all the guitarists I follow religiously, I find Gem Archer’s tone to be by far the most interesting and pleasing to the ear. Proudly, my hobby has been to acquire as many guitars of the same brand and model that he plays in concert and on record as possible. This is a very expensive and time-intensive feat, but I almost always end up with the piece of equipment I set out to acquire. I am not in a band. I am a basement player and guitar collector. I have had the pleasure of getting a personal tour of Gem’s live setup when Beady Eye was on tour in December 2011. It was an absolute honor to be able to touch the instruments I have spent endless hours listening to. I have pictures of his complete rig and pedal board, but I have agreed to not publish all of these. I am positive that my list is not complete. For instance, I know he used his Firebird VII on more than one song on the 2002 tour, but have no documentation of this. If you have documented proof (video) of him playing a certain guitar on a certain song I do not have listed, please e-mail me at the below address, and I will credit you with this find. This also goes for his acoustic guitars on the Paul Weller acoustic tour and any other guitars you might find pictures of Gem playing. I hope this decade's worth of guitar tone obsession serves some good to someone. Look forward to similar sites in the future based on the gear of Andy Bell, Steve Cradock, Paul Weller, and maybe even Noel Gallagher. While in New York City interviewing Steve Cradock in 2010 for Buffalo Spree magazine, I was supplied with an hour's worth of incredible information about his gear, body of work, and time with Weller and the Gallagher brothers. All of this will surely make for a fine site! Please contact me at anthony@gemarchergear.com. 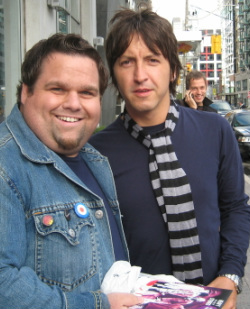 Photo taken by Christopher Schobert in Toronto, just before the gig where Noel was attacked on stage in 2008.